Cascade Complex houses many art exhibitions on each floor, cascading down from a hill to the city center. Based in Istanbul, the Hrant Dink Foundation organized a special program in Yerevan, the capital of Armenia, for journalists in the last week of May. For the first time in my life, I had the chance to go to Yerevan as part of a distinguished group of journalists. Our time in Yerevan started at Republic Square, surrounded by the National History Museum, the former building of the foreign ministry and the Marriot Hotel, all of which were built in the neoclassical style. The first thing that caught my eye was the unique color of the stone buildings in the city. Yerevan is known as the "pink city" due to the special pinkish color of the local stone, which is a very widely used construction material. Although stone construction is special and rare in other countries, it is very common in Yerevan, both thanks to the abundance of the material and the local craftsmanship. Sergei Parajanov's artwork can be seen at the museum named after him. The city is built around this square in accordance with a spiral-shaped urban plan drafted by Alexander Tamanian, who was mostly inspired by European cities like Paris and Vienna. The city is adorned with many museums, galleries and concert halls as well as the great Soviet-era opera building in the city center. Just like in many countries that have been influenced by the Soviet understanding of art, Armenia has also a strong propensity for art. As a matter of fact, Armenians have been intertwined with music and handcrafts for centuries themselves. It can well be said that the city offers a nice mixture of well-preserved traditional and modern arts. It is highly possible to see an artist selling his work in parks. Those interested in visiting indoor exhibitions can go to the many museums and galleries scattered around the city. There are both personal exhibitions and permanent institutional exhibitions in every corner of the city. The National History Museum, located in Republic Square, is a huge museum that displays historical artifacts that document the history and civilization of the area as well as the Armenian people. The museum is designed similar to those in European countries, especially in Berlin's Museums Island. In order to see every piece and read the info below them, one has to spare half a day at least. The Blue Mosque is the only mosque in Yerevan. 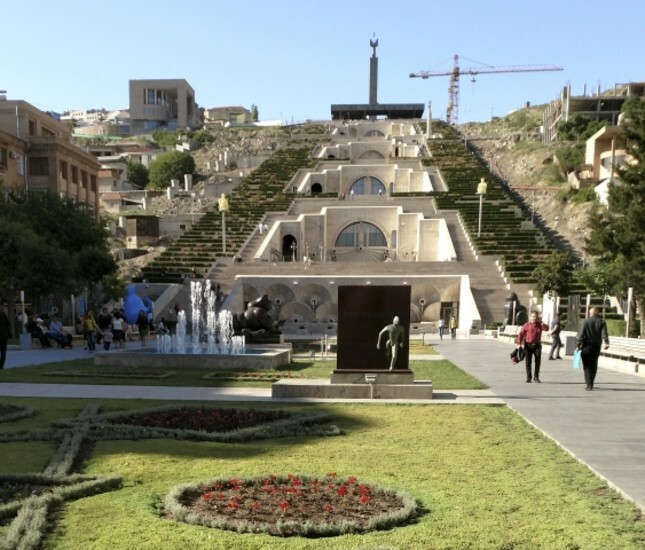 For the other half of the day, art lovers can spend satisfying time around Cascade Complex, which houses many art exhibitions on each floor, cascading down from a hill to the city center. The center has a great garden surrounded with cafes and souvenir shops. The garden is decorated with the eye-catching works of the world-famous Colombian sculptor Fernando Botero, known for his chubby cats, women and men. After some quality time at cafes with a panorama of Botero sculptures, the art galleries at the Cafesjian Center for the Arts located in the complex is a good next stop. Planned in the Soviet era by architect Tamanian, the building gained its final shape in 2002. It now serves both cultural and recreational purposes. Another must-see museum is the great Soviet director Sergei Parajanov's house, which his lifetime did not suffice to live in. Born in 1924 in Tbilisi, the Armenian artist is considered one of the greatest directors of all times. However, he had to struggle with imprisonment, Soviet censorship and bans throughout his life. As he opposed the general boundaries of the government at that time, by using themes of politics, religion and bureaucracy, he was banned from film for 15 years. Filled with inspiration, he was directed to express his soul in collages he made out of any material he could find, like pieces of glass, woods, buttons, lacework and other bric-a-brac. He collected photos, objects symbolizing the Soviet Union such as miniature trains, hats, and bottle caps on which he etched nails. Although he is mostly known for his film "Sayat Nova," which premiered under the title "The Color of Pomegranates" in 1969, he made art using anything as an artistic tool. Accompanied by a guide in the museum-house, you can learn all the details of the director's life that started in 1924 and came to an end in 1990. Republic Square is adorned with buildings made from unique pink stone. As arts and handcrafts are omnipresent in the country, it is not surprising that one of the most important tourist and local attractions in Yerevan is the open-air flea market, Vernissage, in the city center very close to Republic Square. Open on weekends, it is a huge market with many stands selling several kinds of artistic production from paintings to embroidered clothes, wood carving, silver jewelry, copper coffee pots and leather goods. If you are interested in Armenian music, you can buy a duduk, a reed-blown aerophone, at the market. Duduk is the traditional Armenian instrument. You can hear one of the best duduk performances from Djivan Gasparyan, who performs Armenian music with a deep, lachrymal approach. For Muslim visitors who want to pray and others interested in seeing the largest mosque in the southern Caucasus, the Blue Mosque offers a spectacular scene. The mosque was built in 1765 on 7,000 square meters. Its main dome is 20 meters tall, accompanied by two smaller domes. It is adorned with mesmerizing blue tiles that defy time. The yard is surrounded by 24 rooms in which Islamic handcrafts and photographs are displayed. When it comes to the Armenian cuisine, those who are familiar with Anatolian food would not have problems adapting. In fact, they will have dozens of options, as similar ingredients are used. Most of the food actually exists both in Armenian and Turkish cuisine. One of the most famous meals at a typical Armenian kitchen is "dolma," which is also one of the main foods on Turkish tables. Made with pepper or cabbage, the ingredients are almost the same with one difference: Armenians use a lot of tarragon while in Turkey people usually prefer parsley for the rice as the stuffing material. Artwork on sale in a park. In any restaurant, you can find lentil or yogurt soup just like in Turkey, and the two versions taste nearly the same. You can also easily find kebabs and shawarma, namely chicken döner, typical foods at the Middle Eastern restaurants. Some restaurants serve lahmacun, which is sliced meat with tomato and onion paste on pita. While Turkish lahmacun is on thin dough, the Armenian version is thicker, more like a pizza. After having a delicious meal, you can have an Armenian coffee. It is cooked in copper pot similar to the Turkish "cezve" and served in small cups just like Turkish coffee, but Armenian coffee tastes softer while Turkish coffee is stronger and sourer. Offering tourist visas at the airport, Armenia can be a good substitute to spend a weekend as a close alternative for those who live in Turkey.